Superbrothers: Sword & Sworcery EP is an adventure game created by Superbrothers and Capybara Games, with music by Jim Guthrie. Superbrothers: Sword & Sworcery EP is an adventure game created by Superbrothers and Capybara Games, with music by Jim Guthrie. "With over 1.5 million copies sold, it’s pretty obvious that #Sworcery has been a resounding success. And we’d like to share a few details of that success with you. There’s not that many titles out there that began on iOS and made their way to this many other platforms over time, so we hope that this info is helpful in some way/shape/form." Good for The Superbrothers & Capy. It's cool to see great games find an audience. http://www.capybaragames.com/2013/07/a-sworcery-infographic/ "With over 1.5 million copies sold, it’s pretty obvious that #Sworcery has been a resounding success. And we’d like to share a few details of that success with you. There’s not that many titles out there that began on iOS and made their way to this many other platforms over time, so we hope that this info is helpful in some way/shape/form." Sword & Sworcery made a few waves when it was released as it blended Adventure gaming with a fantastic score. As Sword & Sworcery made its way to be localized for Japan, Jim Guthrie released a remix album called "The Scythian Steppes: Seven #Sworcery Songs Localized for Japan." I picked up the album on Jim's Bandcamp page and wanted to toss out a few words about it. I recommend downloading this album if you enjoy listening to Jim Guthrie's music because these remixes take his work and bring it a unique voice. Jim Guthrie's music is already very eclectic and the first remixes seen in Little Furnace and The Ballad of the Space Babies really bring a certain modern... Read All Sword & Sworcery made a few waves when it was released as it blended Adventure gaming with a fantastic score. As Sword & Sworcery made its way to be localized for Japan, Jim Guthrie released a remix album called "The Scythian Steppes: Seven #Sworcery Songs Localized for Japan." I picked up the album on Jim's Bandcamp page and wanted to toss out a few words about it. I recommend downloading this album if you enjoy listening to Jim Guthrie's music because these remixes take his work and bring it a unique voice. Jim Guthrie's music is already very eclectic and the first remixes seen in Little Furnace and The Ballad of the Space Babies really bring a certain modern techno drive to the start of the album. The album continues on with a pretty interesting array of sound scape remixes and ends of with a Bones McCoy remix laden with heavy guitars. So I just picked up Sword and Sworcery through the recent Humble Bundle for Android. I had been hesitant to try it mostly because of how big my gaming backlog already is, even with jdodson singing its praises earlier this year. Now that homework has leveled out, and I'm spending late nights on duty in the lab, I grabbed the bundle so I could play some games on my MacBook while I waited out my shift. I was more than pleasantly surprised when I booted up the game. Here's a few things I noticed. First, the game was subtle in how it taught you how to play. It either let you figure it out, or gave a small visual or textual hint on how the controls work. Instead of flat out... Read All So I just picked up Sword and Sworcery through the recent Humble Bundle for Android. I had been hesitant to try it mostly because of how big my gaming backlog already is, even with jdodson singing its praises earlier this year. Now that homework has leveled out, and I'm spending late nights on duty in the lab, I grabbed the bundle so I could play some games on my MacBook while I waited out my shift. I was more than pleasantly surprised when I booted up the game. Here's a few things I noticed. First, the game was subtle in how it taught you how to play. It either let you figure it out, or gave a small visual or textual hint on how the controls work. Instead of flat out saying "Double-click the mouse to move," the game just have the clue of "Tip Tap?" to guide you to a door. It feels more immersive that way. Secondly, the game advises you to play in small chunks. Once you get to the end of a chapter, it advises the player to take a break and takes you to the main menu. It's not intrusive like the Wii Sports "Why not take a break?" message that comes up when you start a round. Instead it waits until you're done with that chunk of the story. It's like reaching the end of a chapter in a book. There's still more to look forward to, but it's still a good break point. I'd lose track of time if it weren't for this aspect of the game. Thirdly, the way it tells the story is really fun. Most of the story is conveyed through text and the language used is somewhat humorous in the way it says what's going on, but is still short, sweet, and to the point, allowing for more time in game. Also, you can link the game to twitter so it can tweet the text of a given scene in game. I didn't have a use for twitter until that point. Even with the good, I'm not fond of the mouse only controls. They work well, but I feel limited in what I can do by not using the keyboard too, but for all I know, there are keyboard controls, and I just don't know them. I agree with every single thing you said. The mouse controls are the only thing I haven't liked (didn't get far into it, granted). So the game was made for iPhone/iPad so it makes sense there are no keyboard controls because the phone doesn't have them either :D It was brought to PC afterward and then to a bundle and now to the Android bundle. If you havent picked up The Humble Bundle V yet, you should. If you haven't picked up The Humble Bundle V yet, you should. So many awesome games included and this time around the bundle includes FLAC files for all the soundtracks. 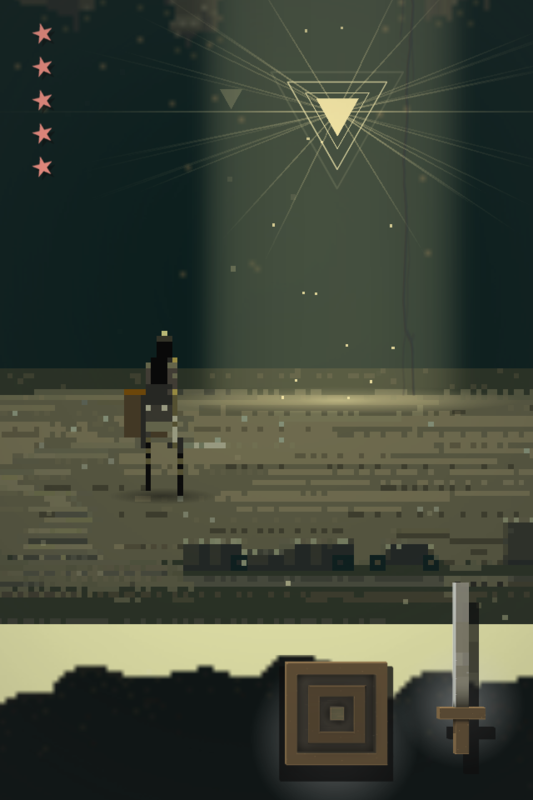 That said, the port of Sword & Sworcery to the PC and Mac is superb(included in the bundle). I wasn't sure a game made for touch devices would translate well to the mouse and keyboard but it does. I am going to finish my game on my iPhone because I have played pretty far on that device, but if you have the humble bundle 5 I implore you to give Sword & Sworcery a try. Recently I was at the Trigon battle(I snapped the pic above) and kept dying. Since when you die you... Read All If you haven't picked up The Humble Bundle V yet, you should. So many awesome games included and this time around the bundle includes FLAC files for all the soundtracks. Recently I was at the Trigon battle(I snapped the pic above) and kept dying. Since when you die you immediately re-spawn with one star for life its not too punishing. That said, taking one star of life into the Trigon battle isn't great so I did a few Google searches on how to beat it with one star of life. Come to find out if you hold down the shield in ANY battle for 10 or so seconds you replenish a star of life. That means if you start the Trigon battle with one star by the time it swings at you the first time you can replenish up to four stars of life which allows you to beat the boss. A few times I needed to lookup how to get past certain levels as like many adventure games the path forward isn't obvious. That shouldn't detract from you playing the game though, its great. PS Tried all the Linux ports of the Bundle games and they worked very well on my Ubuntu 12.04 system. Occasionally games come along that change the way you think about what games can do. A month or so back I heard that Sword & Sworcery was a rad iOS game that took the experience beyond the typical mobile game faire to have a great story and interesting game mechanics. I picked it up hoping for great and I wasn't disappointed. The game brings you into its unique universe from the start and I was immediately hooked. I watched the entire intro and "more information" game sections before I even started playing. It was that unique. The game is stylistically similar to the old Out of this World game released on PC and Super Nintendo. It forgoes speech in favor of text and... Read All Occasionally games come along that change the way you think about what games can do. A month or so back I heard that Sword & Sworcery was a rad iOS game that took the experience beyond the typical mobile game faire to have a great story and interesting game mechanics. I picked it up hoping for great and I wasn't disappointed. The game is stylistically similar to the old Out of this World game released on PC and Super Nintendo. It forgoes speech in favor of text and that works very well for the game. It also has a very simple control and fight mechanic. If you want to fight you put your phone up and down and when you want to move around the world you have to put the phone on its side. Simple. My only downside to this game is that it joins many other awesome adventure games in its "mystery meat" puzzle hardness factor. Old games like Day of the Tentacle and Full Throttle were awesome, but often you had to do very non obvious things to progress. I am at such a part now and am considering using a walkthrough to get past it. I guess it bears noting that I haven't really played a game in years that required me to think about going to a walkthrough. The game has an interesting mechanic where you can read the minds of anyone you come in contact with. You can go to a screen where you can read through all their thoughts and this adds a real depth to the world and tone of the game. For instance, there is a dog in the beginning part of the game and you can read his thoughts. It being occasionally difficult shouldn't stop you from picking it up, its fantastic and if you are looking for a richer mobile game experience, this is it. Oh and its for sale on Steam as well now until April 28th so no reason not to pick it up!